4 in stock Free Shipping! Cultured Whole Food - Organic fruits, vegetables and whole-food vitamins & minerals work together to promote optimal health - not just address nutrient deficiencies. 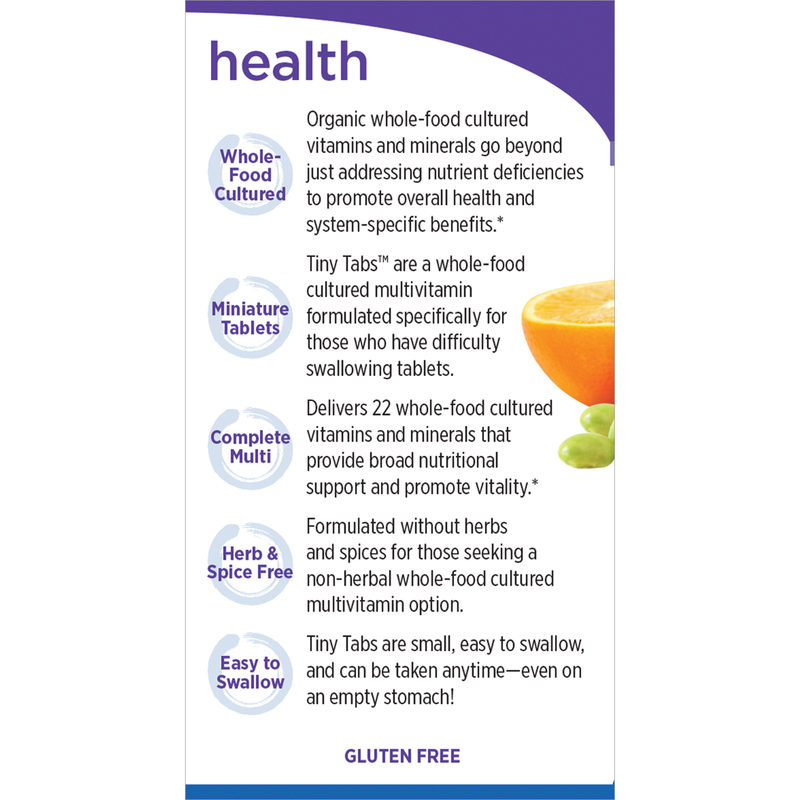 Miniature Tablets - Tiny Tabs is a probiotic whole-food multi-vitamin formulated specifically for those who have difficulty swallowing tablets. Maximum Nutrition - Delivers 24 whole-food vitamins and minerals that provide complete nutritional support and promote optimal vitality. 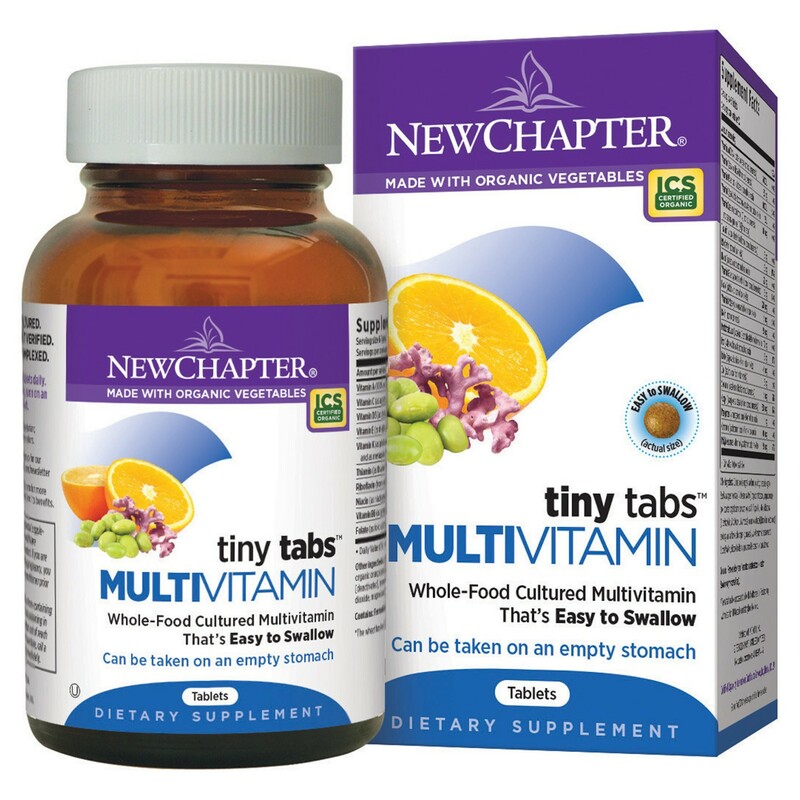 New Chapter Tiny Tabs Whole-Food Multivitamin more than food supplements, they’re supplemental food. 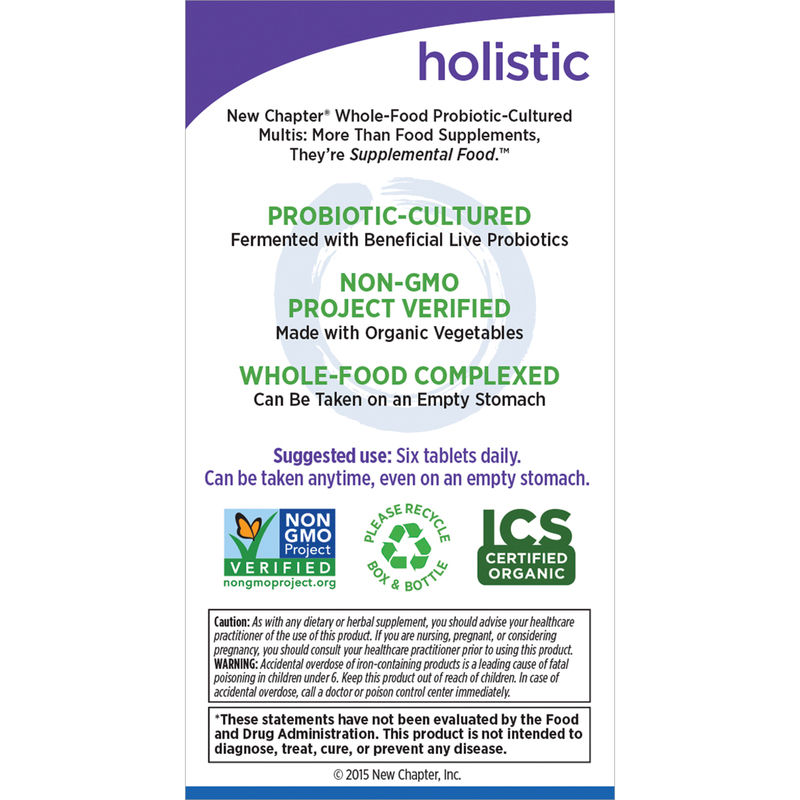 All of New Chapter’s Multi-vitamins are probiotic and whole. 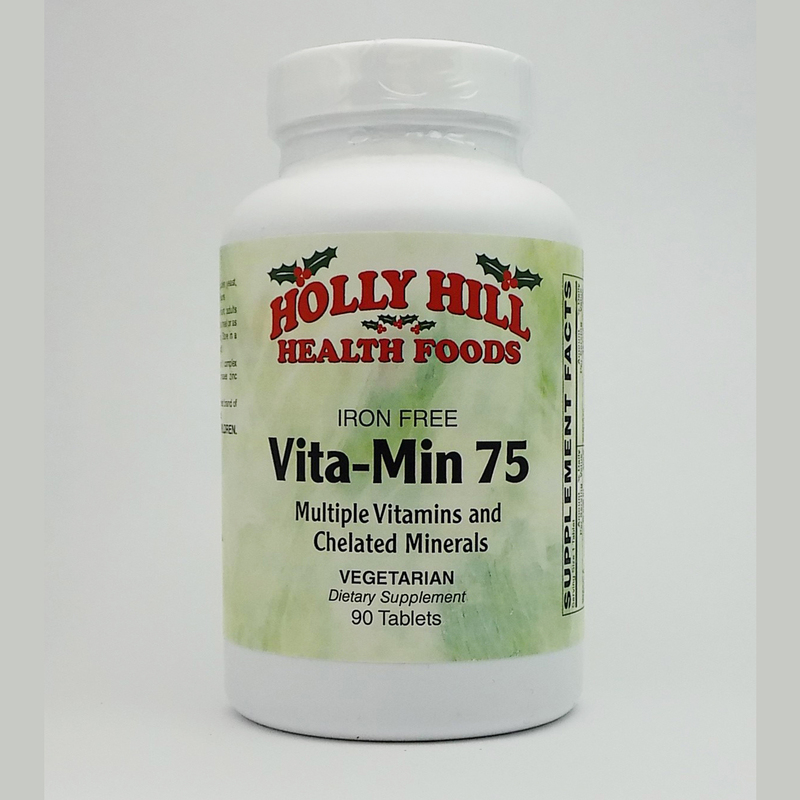 The herbs and cultured whole-food vitamins & minerals in each formulation work together to promote optimal health and deliver condition-specific benefits – not just address nutrient deficiencies. 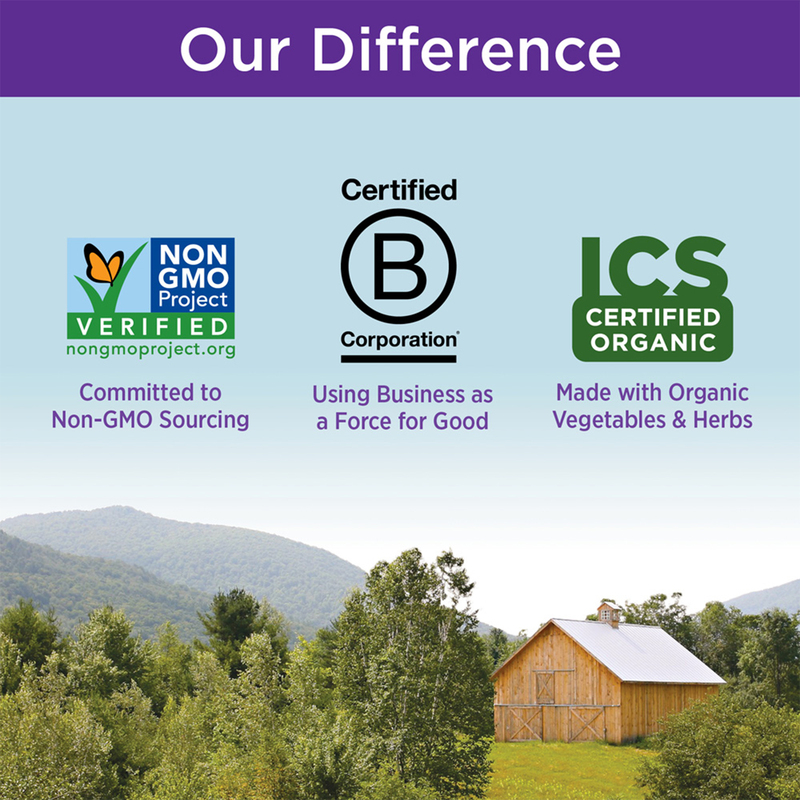 New Chapter Multi-Vitmains are also Non-GMO verified - made with organic fruits and vegetables. Vitamin A (100% as beta-carotene from culture media). Vitamin C (as ascorbic acid from culture media), Vitamin D3 (as cholecalciferol from culture media), Vitamin E (as d-alpha-tocopheryl acetate from culture media), Vitamin K (as phylloquinone [K1] from culture media and as menaquinone-7 [K2] from natto), Thiamin (as thiamine hydrochloride from culture media), Riboflavin (from culture media), Niacin (as niacinamide from culture media), Vitamin B6 (as pyridoxine hydrochloride from culture media), Folate (as folic acid from culture media), Vitamin B12 (as cyanocobalamin from culture media), Biotin (from culture media), Pantothenic Acid (as calcium D-pantothenate from culture media), Iron (as ferrous fumarate from culture media), Iodine (as potassium iodide from culture media), Zinc (as zinc oxide from culture media), Selenium (as selenium dioxide from culture media), Copper (as copper sulfate anhydrous from culture media), Manganese (as manganese chloride from culture media), Chromium (as chromium chloride from culture media), Molybdenum (as sodium molybdate from culture media). Other ingredients: Culture media (organic soy flour, organic gum acacia, organic Saccharomyces cerevisiae [active and inactive], organic maltodextrin, organic orange peel powder, organic carrot powder, organic alfalfa powder, lactic acid bacteria [L. acidophilus, B. bifidum, L. rhamnosus], papain [deactivated], bromelain [deactivated] and organic safflower oil), organic gum acacia, Lithothamnion (L. calcareum and L. corallioides), silicon dioxide, magnesium oxide, lac resin and carnauba wax. Contains: Fermented soy and fermented wheat (as food source for Saccharomyces cerevisiae). The wheat has been processed to allow this food to meet the Food and Drug Administration (FDA) requirements for gluten-free foods. Gluten free; 100% vegetarian; no artificial flavors or colors. Six tablets daily. Can be taken anytime, even on an empty stomach. 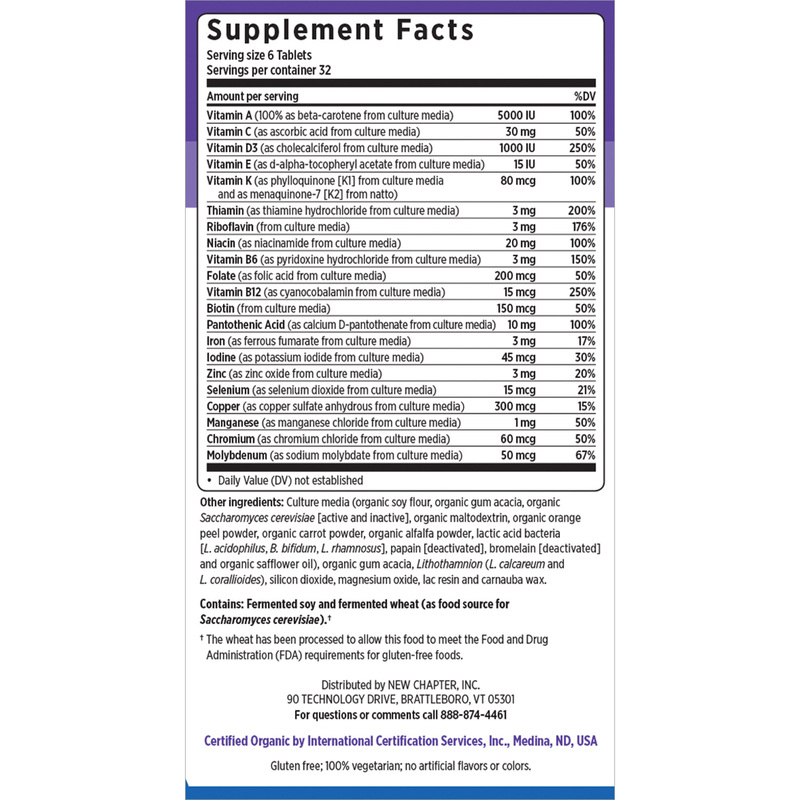 See Supplement Facts. As with any dietary or herbal supplement, you should advise your health care practitioner of the use of this product. If you are nursing, pregnant, or considering pregnancy, you should consult your health care practitioner prior to using this product. WARNING: Accidental overdose of iron- containing products is a leading cause of fatal poisoning in children under 6. Keep this product out of reach of children. In case of accidental overdose, call a doctor or poison control center immediately. **** Nutrients and herbs are cultured in organic media that may contain: organic milled soy, Saccharomyces cerevisiae (organic yeast: active and inactive), organic maltodextrin, organic gum acacia, organic orange and lemon peel, organic carrot powder, organic alfalfa powder, Lactobacilli (L. acidophilus, L. bifidus, L. rhamnosus) and enzymes (deactivated).